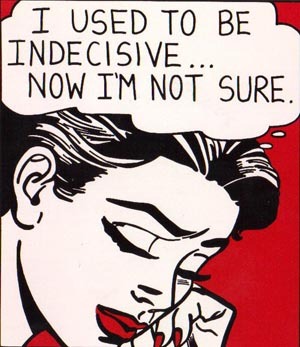 I cringe to think of how much time I’ve wasted making decisions. The hours I waste paralyzed in the cereal aisle easily match the time I spend eating cereal (and I always end up choosing Oatmeal Crisp anyways). Personally speaking, the ratio of time spent agonizing over a decision to time spent enjoying the outcome is roughly 7:1. The debilitating fear that leads us to second-guess is nothing new – just ask Hamlet or J. Alfred Prufrock – and, of course, little has changed about us as people. The “paralysis of analysis” is today’s hippest diagnosis among therapists due to our collective inability to make choices, big or small, for fear of living in regret. Other decisions, far more weighty than cereal selection – where to live, who to marry, what to do for a living – can be infinitely more paralyzing. And even if we get the answers right, it often seems we’re still short of finding a solution. Thankfully for us non-commitals, The New Yorker recently published a piece by Malcolm Gladwell on the brilliantly entertaining 20th century economist Albert O. Hirschman. By trade, Hirschman was a “planner,” consulting heavy-hitting tycoons like the World Bank and the Federal Reserve Board. He studied multibillion-dollar projects and his advice held enough weight to determine the economic fate of several developing countries. Strangely enough, despite his level of power, Hirschman’s theories defended bad planning more than they did expert strategy. Hirschman was fascinated by how some of the most successful outcomes have risen from the ashes of utter and disappointing failures—leaving us to believe that we can never plan perfectly. We ended up here with an economic argument strikingly paralleling Christianity’s oft expressed preference for the repentant sinner over the righteous man who never strays from the path. Only Hirschman would circle the globe and be content to conclude that he couldn’t reach a conclusion—for a long time, if ever. He was a planner who really didn’t believe in planning. He wanted to remind other economists that a lot of the problems they tried to fix were either better off not being fixed or weren’t problems to begin with. And just as our failures are covered by grace, so are our victories. Hirschman realized that, since we’re never in control of the outcome of a situation, our successes too are based largely on dumb luck (aka grace). While we are rather willing and even eager and relieved to agree with a historian’s finding that we stumbled into the more shameful events of history, such as war, we are correspondingly unwilling to concede – in fact we find it intolerable to imagine – that our more lofty achievements, such as economic or political progress, could have come about by stumbling rather than through careful planning. “Theorizing that the history of human progress is based on dumb luck is all well and good,” you might say, “but how does this way of thinking apply to our everyday lives? There is the value of discernment and good judgment…” To this, I suspect Hirschman would say that no matter how discerning you are, life, in all its unknowingness, is quite capable of throwing you enough “unintended consequences and perverse outcomes” to make you too afraid to even plan a trip to the market (let alone get out of bed in the morning) unless, of course, you are given the gift of faith. Full alliteration points granted from erstwhile English teacher. Oh, and splendid piece as well . . . “trust God and live.” Golden.